2 tbs maple syrup or sweetener of your choice. 2 cups cornbread of choice, cubed and dried for one day. 2. Prepare pumpkin. Cut around stem of the pumpkin about 4 inches in diameter and set aside. Scrape seeds from pumpkin (you really ought to dry them out and eat them) but leave pulp intact. Set aside. 7. 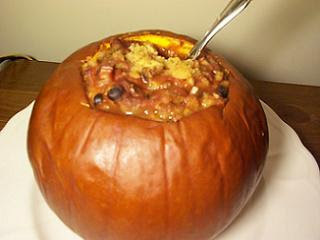 Put chili mixture into the pumpkin and place the pumpkin inside of a sturdy pie pan on a cookie sheet (note, the pumpkin will need to be served on whatever its cooked on because the bottom will become weak and break easily) bake for about one hour or until the sides of the pumpkin are malleable to the touch. The stem may be returned tot eh top of the pumpkin for presentation. Before serving, mix up the contents of the pumpkin, scraping the sides to release the pulp and mix it in with the chili. Enjoy!